Hangzhou Sida Mechanical & Electronic Co., Ltd.
HSZ-A chain hoist is a portable lifting device easily operated by hand. It is suitable for use in factories. 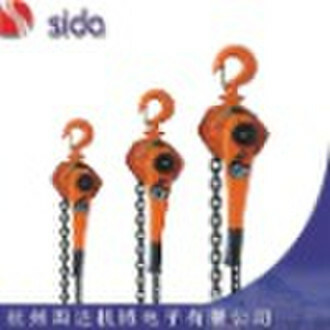 SIDA chain hoist characteristics: 1.capacity ranged from 0.5T to 10T. 2. auto double pawl braking system. Remarks:Hoist with the lift in other lengths are also available.